I was recently contacted by Sara of Amazing Taste Foods. She asked me if I'd like to try some of their sprinkle on seasoning packets. Well, yeah. I do love to try new things, and I'd probably try almost anything at least once- you never know until you try it, right?! 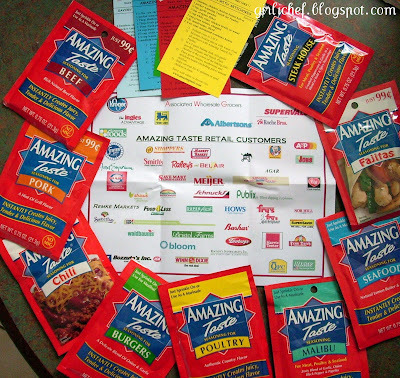 I received all 9 of their Amazing Taste Seasoning packets to try! They have 5 basic "protein specific" packet which include Beef, Pork, Burger, Poultry and Seafood; there are also 4 general packets- Chili, Fajita, Malibu and zesty Steak House. I don't use spice packets very often since I have a habit of buying all kinds of spices and herbs...and then I mix my own, but I have been known to grab a few packets to keep around the house in case of laziness or in-a-hurry-ness. You can find these packets in a lot of grocery stores....here is what they look like (along w/ a listing of the stores where you can find them). They even threw in a few recipes! I decided to use the Pork seasoning and the Chili seasoning. I grabbed: about a pound and a half of thin cut pork chops and sprinkled them with a half a packet of Amazing Taste pork seasoning. I then heated up the grill pan, misted it with some pan spray, and "grilled" up some chops! Next I used: 1 (19.75 oz.) can of Black Beans, drained and added 1/2 packet of Amazing Taste Chili Seasoning and 1 1/4 c. Chicken Broth. 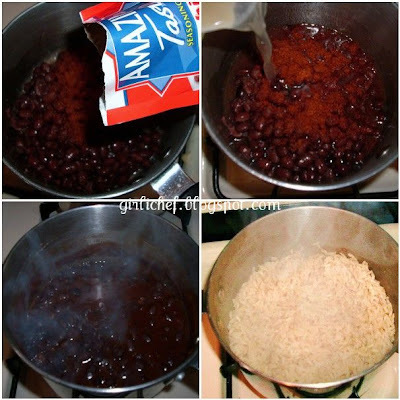 I also put on a pot of brown rice to cook while the beans simmered. Once the rice was cooked (about 20 mins. ), the beans were ready. "Grilled" Pork Chops w/ brothy Black Beans and Brown Rice. 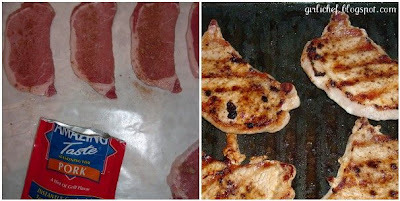 This pork seasoning has a "hint of grill flavor"...which is why I chose to use the grill pan. It really did taste like I threw it outside on the charcoal grill (which I love dearly). The beans were slightly spicy and full of flavor! All I had to add was the beautiful, chewy & nutty brown rice and some cream with a sprinkling of fresh herbs. So, next time you're at the market, grab a couple of packets of Amazing Taste Seasonings...I think you'll be pleasantly surprised. Oh, and of course, there is no MSG added. PS...don't forget to enter my GIVEAWAY and chile roundup...cookin' w/ chiles this month? Send your link and a photo my way! I've never heard of these before. Sounds and looks like they made a delicious meal. 'Tu eres la mejor del mundo'! I'll have to keep my eyes open for them in the grocery store. I love the way you put this together! I can almost taste it. It's beautifully plated too! That is great that you got to try all of those seasonings. I don't know if I have seen this brand. I haven't seen these yet either, but it wouldn't have been something that I would have looked for. Now I'll have to keep an eye out for these. I'm pretty simplistic as a rule, but it's nice to serve meats, for example, that have a bit of spice to them. I just got a bunch of those too, I haven't decided what I'm going to do with them yet though. Glad you enjoyed them, those chops look awesome. I hadn't heard of them either. they sound good, though. I'm a HUGE seasoning fan. these packets sound amazing, and so easy to just jazz any dish up! I'll be looking out for them! The Amazing taste sounds excellent with beans! these seasonings were fun to experiment with! These packets are new to me too. I don't use a lot of them to begin with, but I would certainly use the pork one if it gives a real grilled flavor...that would be wonderful. The whole time I was wondering if they had MSG in them, you probably checked first thing, just like I would. You made a delicious creation with them! Oh, look at the kitties on your sidebar! Now we could talk cats! I am definitely up for Indy!! I have a couple of these packets in my pantry and haven't tried them yet. I am going to get them out. I need to get on the list to get some of these awesome products!! Once again, thanks for sharing. Love all the photos! Product trials are a fabulous benefit of food blogging, so much fun for us and a great source of advertising for them too. I don't think we have that product in Canada, but I agree it is nice to have something like this to come home to at the end of a busy day. I had gotten some of the seasonings, too. I'm still trying to figure out that I can make with them. I'll eventually think of something. everything here is new to me.........nice presentation!! You did wonderful things with these spices. I have yet to put mine to use. Your pork chops look wonderful. Hey there girlichef. Great thinking on the use of the seasoning packets. I'm not a big fan of black beens, but I bet it would be great with pinto beans also. Have a great weekend. How fun to get to play with all those different spices, this looks absolutely divine! I've never heard of these... I will have to look for them and try one. How lucky you are to get such gifts. I would love to experiment with new seasonings. You made good use of them. I'll have to look for this brand in the grocery. You served up some amazing food! That's a fabulous plate! You've got all my faves there, particularly the black beans and rice. I could totally live on those alone! I have never seen Amazing Taste seasonings. I keep a billion spices (really - almost as much as or national debt-okat that would be a trillion) in the house - all over. I also keep seasoning packets for the days I want to throw something on and forget about it. Now, getting grilled otside flavor - inside - that works! Wow, I am always curious about spice packets, but I never buy them. I guess I like mixing my own, like you! I'll have to look for these when I'm at the store next time - I've never noticed them...but they sound pretty good. 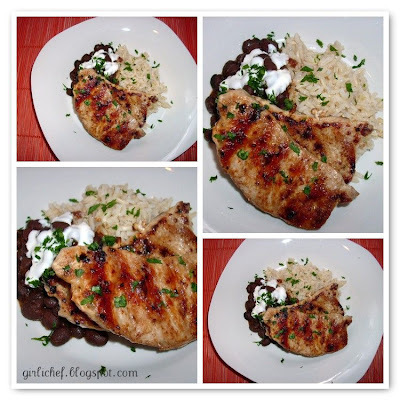 looks great love rice and beans simple and nutritious great music on the blog!! I'm not normally a fan of spice mixes either but I enjoyed reading your review of these. I, like you, make my own mixes because I have tons of spices. I'll have to keep my eye out for these. Thanks for this handy information.